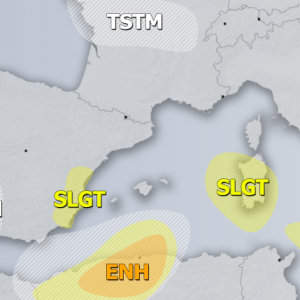 The setup across the Mediterranean through the end of the week is very favourable for persistent rainfall along the orographic boundaries of the northern Mediterranean. Expect excessive precipitation – rainfall at lower elevations and snowfall at higher elevations – across western and southern Alps, the Apennines and the Dinarides. Extreme amounts of precipitation are expected locally, resulting in increased flood, landslide / slope mass movement and avalanche threats. A broad, deep cutoff low will slowly be moving across western Europe into the western Mediterranean between Thursday and Sunday. 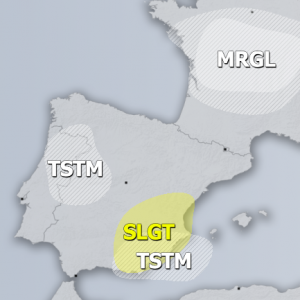 In response to the low, persistent southwesterlies will advect moist airmass from the Mediterranean towards the Alps, resulting in major amounts of orographic and to a lesser extent (locally) convective precipitation. Rainfall totals (or snowfall equivalent) in 200-350 mm until Sunday are expected locally! We take a closer look at individual regions for more detailed forecasts. Intense precipitation begins across SE France and NW Italy (particularly Liguria and Tuscany) on Friday, pushing further eastward into the northern Adriatic region (NE Italy, W Slovenia, NW Croatia) on Saturday. Southeastern France and northwestern Italy will receive 100-200 mm precipitation by late on Saturday. High-resolution models indicate locally even 200-250 mm of precipitation (rainfall) across Liguria and Tuscany and Corsica. Snowfall is expected at higher elevations in the western Alps, up to 50-100 cm in SE France and slightly less in NW Italy. Snow is expected all the way down into the plains of Piemonte, NW Italy. It is more questionable in Liguria and Tuscany, where very high cumulatives are expected: some snowfall is expected towards the end of the period, however, most of the precipitation will likely be rain. Due to the uncertainty in snow/rain ratio it is difficult to asses flood threat: if most of this precipitation falls as rain (likely), then flood threat will be significantly elevated. Also expect lots of rainfall across Corsica, except at the highest elevations, where heavy snowfall is expected. Total precipitation until early on Monday. ARPEGE model guidance. Map: Wxcharts.eu. Total snowfal until early on Monday. ARPEGE model guidance. Map: Wxcharts.eu. It is a typical setup for intense precipitation for the southern Alpine flanks in northeast Italy and western Slovenia and the northern Dinarides of northwest Croatia as southerly (Jugo/Scirocco) and southwesterly winds produce intense orographic and to an extent convective precipitation. Expect rainfall and snowfall at higher elevations to begin on Friday afternoon, persisting until early Sunday afternoon. Total rainfall and snowfall in 24h on Friday. ARW-GFS model guidance. Map: Consorzio LaMMA. Up to 100-200 cm of fresh snow is expected in the Alps of NE Italy and NW Slovenia (maximum amounts are expected in the Julian Alps). Expect extreme rainfall at lower elevations, with locally over 200 mm of rainfall! Very heavy rainfall is also expected in NW Croatia (Kvarner region), with well over 250-300 mm total rainfall (or snowfall) equivalent expected by Sunday afternoon! Expect major flood potential here! Significant instability builds up along the coastal areas of northern Mediterranean, Ligurian and Adriatic seas. Up to ~600-1000 J/kg CAPE will overlap with a very strongly sheared environment, supporting thunderstorms storms with rotating updrafts and slight severe potential. The main threat with these thunderstorms will be torrential rainfall and waterspouts. Also expect thundersnow just inland of the coastal areas in SE France, Liguria and Tuscany as well as along the Alpine flanks in NE Italy and W Slovenia and inland of the Kvarner bay (Gorski Kotar, extreme SW Slovenia around Snežnik). Convective instability across the region throughout the period. ARPEGE model guidance. Map: Wxcharts.eu.